It's November!!! That means it's time for NaNoWriMo!! And I'm so excited about it that I've coerced several awesome authors into writing guest posts for me about their experiences with writing 50,000 words (give or take) in a month. Today, it's my pleasure to welcome Kristin O'Donnell Tubb, author of the wonderful upcoming novel Selling Hope, to Abby (the) Librarian. NaNoWriMo was, to me, always one of those things like running a marathon: “Wow, wouldn’t it be fun to write a novel in 30 days?” Then the doubt would creep in: “You don’t write like that, Kristin. You’re an outliner, a meticulous planner. If you were trapped in a paper bag, you’d draw a map to find your way out.” And on and on and on. But then in late 2008 my friend Candie Moonshower (The Legend of Zoey, Delacorte 2006) encouraged me to give it a try. What do you have to lose? she pointed out. It was true – I wouldn’t collapse from exhaustion or extreme dehydration. The very worst thing that could happen was I’d end up shy of my goal, with a bunch of crummy words. The very best thing that could happen? I could finally finish Selling Hope. 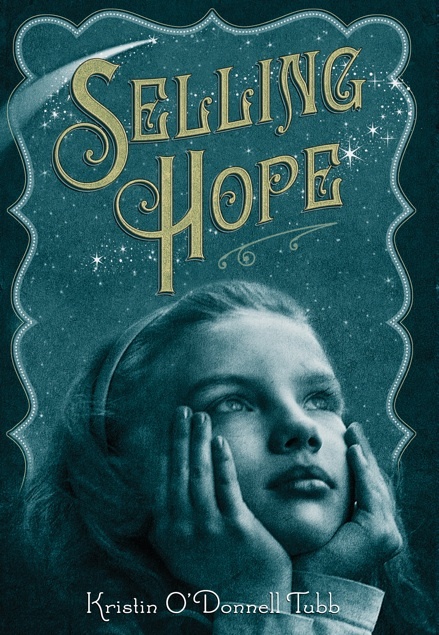 Selling Hope was one of those stories that had been chewing away at my brain for years, and I had tried to write it several ways: YA, then middle grade. With several siblings, then without them. With an evil father, then with an understanding father. I finally developed a very detailed, 20-page outline for the story that I really liked. Now I just had to write the darn thing. Coincidentally, that was the end of October. So when Candie approached me with the idea of participating in NaNoWriMo, I was ripe for the pickin’. I signed up and never looked back. I suppose it’s considered “cheating” by NaNo standards that I’d already plotted my story. But Selling Hope is historical fiction, and I’d been researching it for years. I knew the story I wanted to tell – one of hope in a time of near hopelessness – but I didn’t know the exact path it would take until I finished the book in 30 days in November 2008. I typed “The End” before the end of November. The final manuscript was just over 50,000 words. After a few rounds of revisions, I submitted it to Adams Literary, and Josh Adams became my agent in February 2009. He sold the story to Feiwel & Friends in March. Selling Hope comes out this November 9. NaNoWriMo taught me to silence my inner critic and plow forward. It taught me to write in smaller snippets of time, rather than in the huge chunks I’d always “required” prior. And having a handful of us going through it together, cheering each other on via a private Yahoo! email group, made it fun, too. If you’re considering giving NaNo a try, remember that the worst case scenario for you, too, would be to end up shy of your goal with a bunch of crummy words to show for your efforts. But the best case scenario is having a book come to life. Kristin O’Donnell Tubb is the author of Selling Hope (Feiwel & Friends 2010) and Autumn Winifred Oliver Does Things Different (Delacorte 2008/Yearling 2010). Her website is www.kristintubb.com. She will be polishing a middle grade fantasy, The 13th Sign, during this year’s NaNo, and would love to see you on the NaNo boards!